Looking through Christmas cookbooks helps inspire me for all the cooking that necessarily goes with the holiday season. Often the backbone of what I'll make is already chosen by tradition, but there is always room for something new and exciting. Today I have a number of books to recommend. 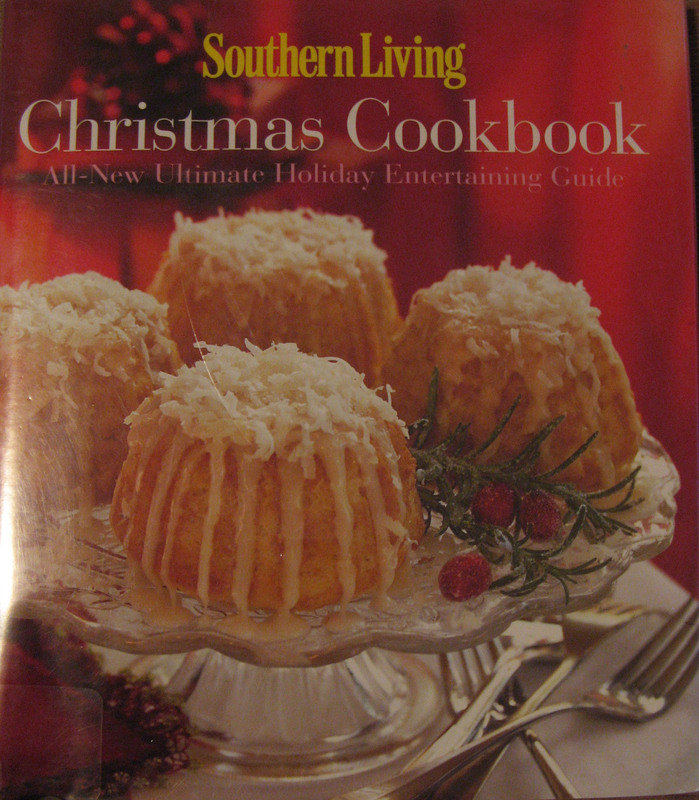 Southern Living's Christmas Cookbook 2008 is so full of good ideas that I've contemplated buying it for my bookshelf. There are recipes for Family and Friends: breakfasts, simple suppers, make-ahead dinners, comfort food and the classic Christmas dinner. There are recipes for Casual Entertaining: holiday brunch, southern brunch, ladies' luncheon, cocktails, holiday buffet, coffee and chocolate party, chili party, open house for a crowd and twelfth night celebration. And then there are specific Holiday Cooking recipes: breakfasts, appetizers, main courses, side-dishes and baked goods. With 279 large pages full of recipes and lots and lots of pictures, you are sure to find a few recipes you want to try and plenty of decorating and serving ideas. 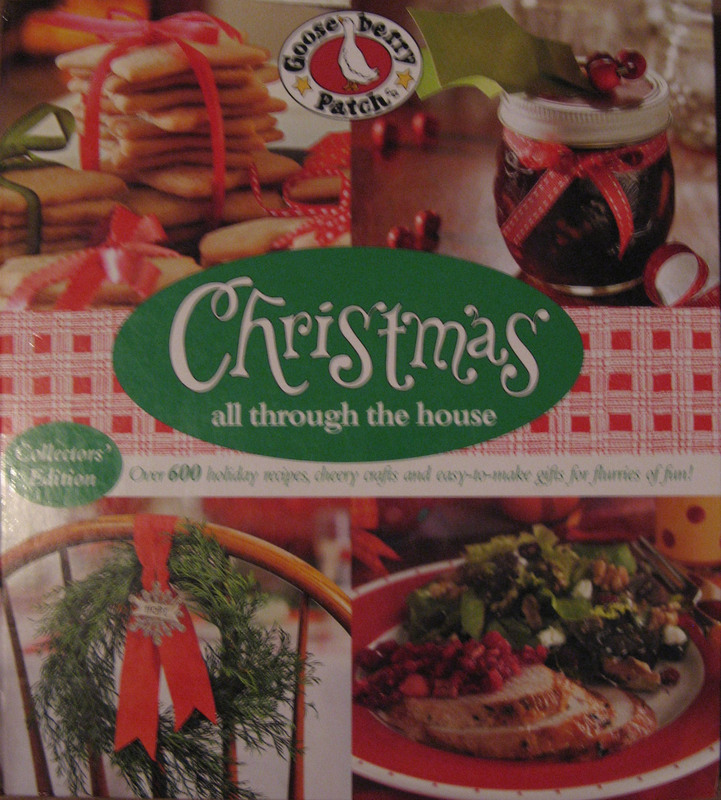 Christmas All Through The House from Gooseberry Patch is a huge collection of Christmas recipes and craft ideas put together in an attractive layout with plenty of pictures. There are so many options and ideas that you could feel overwhelmed. The key is to choose a few ideas, or one theme that inspires you, and run with that. You will find recipes for gift-giving such as Cranberry Cider Mix, Cookie Mixes, Spiced Nuts, etc., all with suggestions on how to package these items. Similar to the Southern Living Cookbook, you will find a myriad of recipes for main dishes, salads, sides, appetizers, and holiday baked goods. I chose to try the Trimming-The-Tree Pita Snacks. The recipe was easy to make and the result tasted great! I'll be making them again. Carefully split pitas into 2 rounds; slice each round into eight wedges. 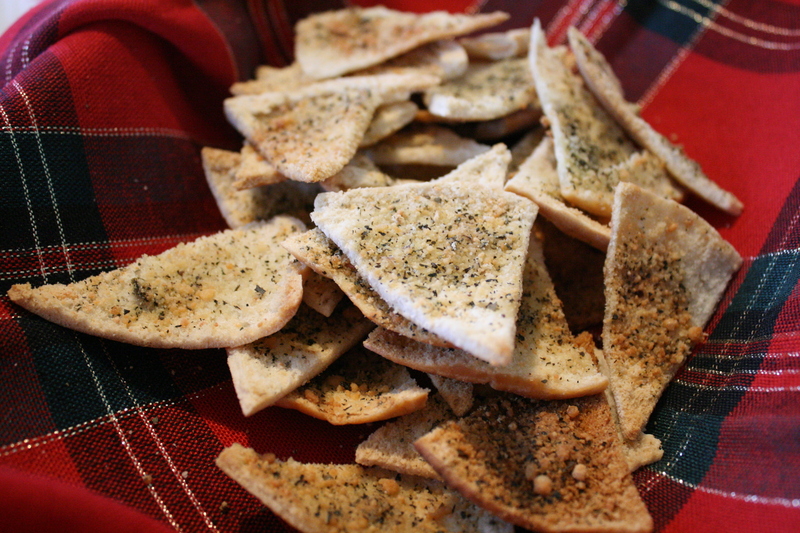 Arrange wedges smooth-side up on foil-lined baking sheets, one pita thick; brush lightly with olive oil. Flip wedges over; brush with olive oil. Set aside. Combine cheese, basil and garlic powder; sprinkle evenly over wedges. Bake at 350F for 12-14 minutes; remove from tray to a wire rack t cool completely. Makes 10-12 servings. 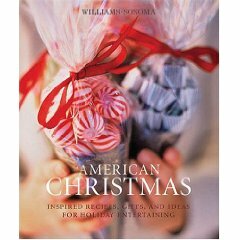 American Christmas by Williams-Sonoma is a beautiful, inspiring book. 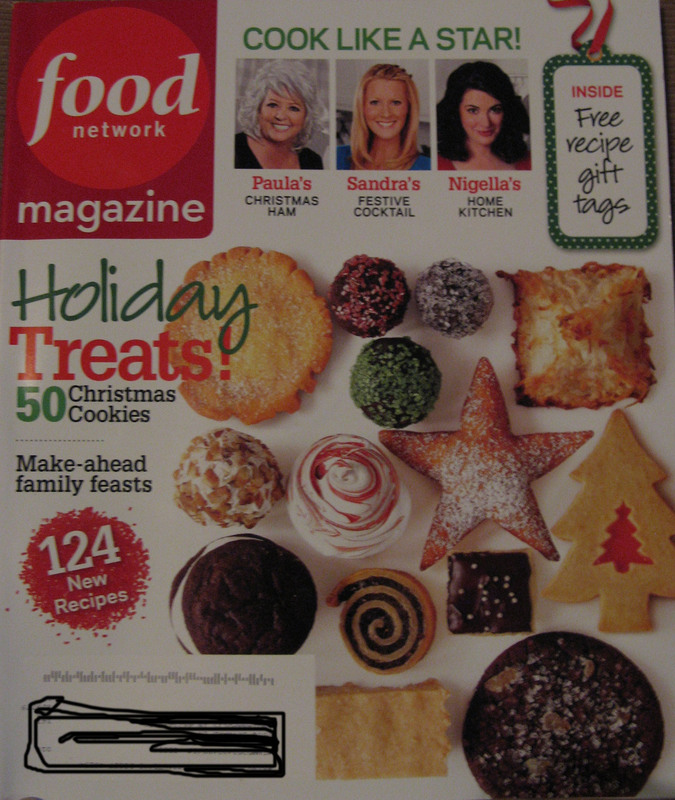 It is filled with stunning photographs and sprinkled with recipes from every part of holiday cooking. It is not as large a book as the two mentioned above, but is rather like a collection of the very best recipes and ideas. I've been tempted to try their savory shortbread and the cranberry chutney, but time has not yet allowed for that. 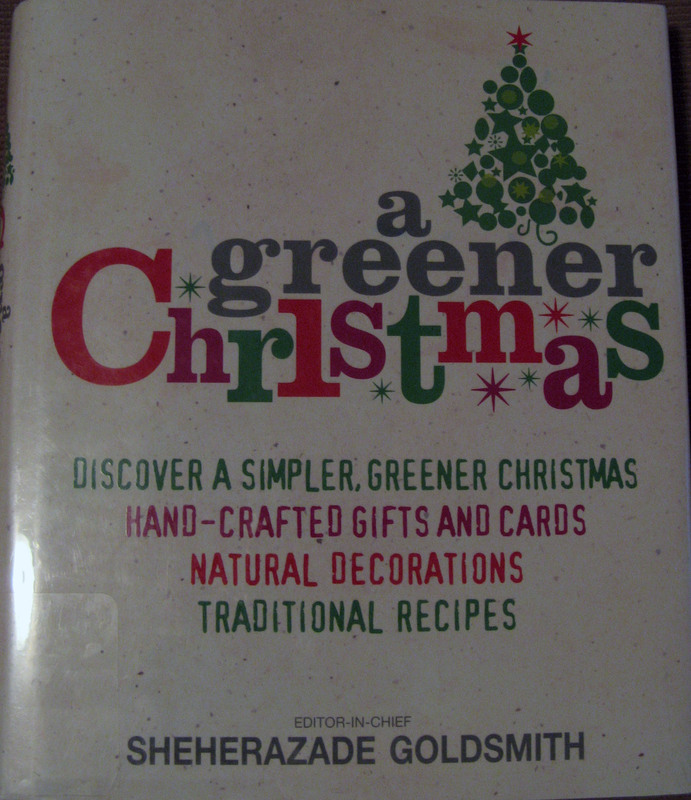 A Greener Christmas by Sheherazade Goldsmith came out last year and is a great book for giving ideas on returning to a home-made, eco-friendly celebration. This book runs heavy on the craft side, but there is still a good collection of recipes to choose from such as flavored oils, fruit jam, pear chutney, walnut bread, stollen, marshmallows, panettone, stuffings, etc., all with an emphasis on seasonal cooking. There are recipes for hams, creative ways to use fruitcake (including stuffed pork medallions), amazing gifts in a jar, homemade eggnog, easy suppers and sides (they look so good I want to make them all! ), a number of complete menus for weekend entertaining, including a savory crepe buffet that looks scrumptious, a creme brulee how-to, and the coolest collection of wreaths made out of candies. You should see the Andes mint wreath, or the wreath made entirely of popcorn. There's even an all-white, marshmallow wreath. Next comes the holiday baking with a pull-out of 50 Holiday Cookies. And there is a tw0-page spread on hot cocoa variations that makes me want to have a party created around this theme. All-in-all, it's a great issue and I'll be keeping it close to hand in the coming weeks. Thanks for including us in this great list...we appreciate it! Loving the British Hummingbird Bakery Cookbook and the Spanish Menu del Dia by Rohan Daf, which is helping take my mind off the cold! Your trimming the tree pita snacks are so simple, yet so insanely good. My favorite Christmas cooking book is definitely American Christmas from Williams-Sonoma. Thanks for the great list!